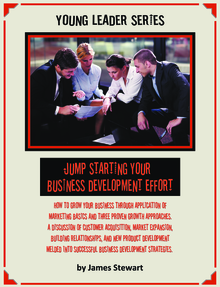 "Jump Starting Your Business Development Effort" is one of a series of a dozen topics included in the YOUNG LEADER SERIES of publications by SHARPER COUNSEL LLC. In this workbook Business Development concepts important for a business to consider are discussed, examples are given, and worksheets are provided to facilitate quick application. The YOUNG LEADER SERIES is targetted at helping new managers develop appreciation for the breadth/width of business issues through identifying typical situations and best practices. This accelerates their ability to grapple with larger and more complex situations and increases promotability.